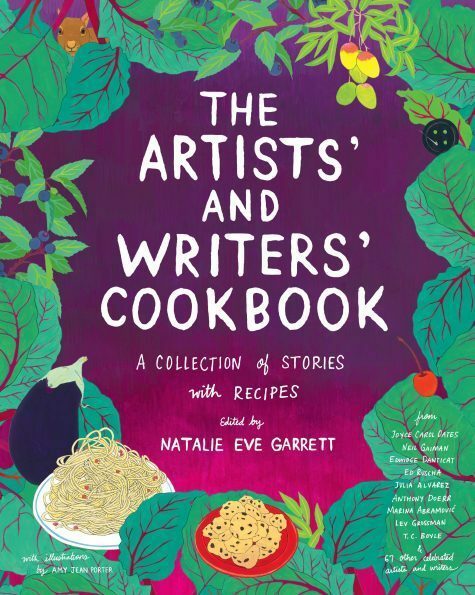 This Friday, author, artist, and editor Natalie Eve Garrett will be here to discuss The Artists’ and Writers’ Cookbook which features intimate, funny, and heartbreaking stories paired with recipes from some of the most brilliant creative minds of our time. And, in what has become a tradition for the Adult Programming team, we decided to try our hand at making a few of the recipes featured in the book. You can find our other cooking attempts here, here, and here. I couldn’t resist choosing Alice Hoffman’s Grandmother’s Recipe for Life (also known as potato soup) for a couple of reasons. First of all, my mother’s potato soup has literal healing powers. Anytime one of my family members or friends had surgery, my mother and I would make the Famous Magical Potato Soup and by morning you would miraculously feel better. I knew going into this that nothing would beat my own mother’s recipe, not even Alice Hoffman’s grandmother’s recipe. There’s no way this soup could be more magical than my mother’s. Even if it’s from the writer of Practical Magic. This recipe called for very few ingredients, and three of them were garlic, onion, and leeks. Nothing compliments potatoes better than onions and garlic! Also, any recipe that calls for wine is a friend of mine. First you chop the trifecta of the onion family. 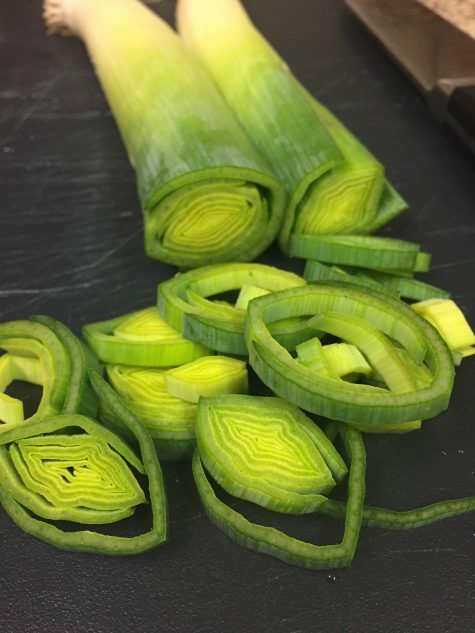 It’s important to spend a sold 5 minutes admiring and photographing the geometric shape and bright green color of the leeks. In a heavy saucepan, melt an entire stick of butter, the onion, lots of garlic, and leeks and cook until soft and starting to caramelize. 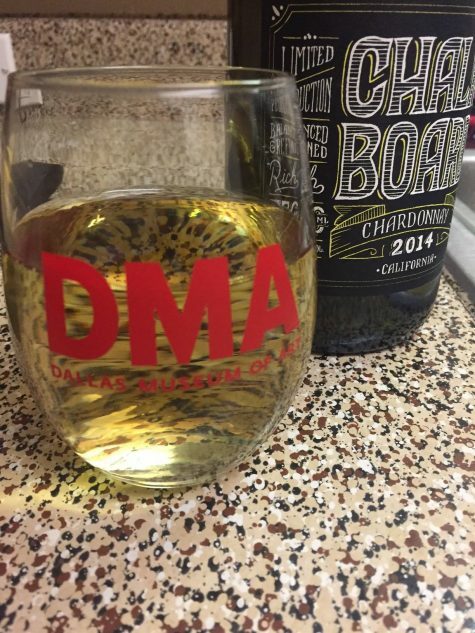 While you stir for about 10-15 minutes, open the wine early and pour yourself a glass (especially in a cute DMA wine glass!). Then chop up the potatoes and toss them in as well. The recipe said to sauté for 7 minutes, but I wanted them to get some brown crispy spots on them before adding in the liquid (caramelization equals flavor! ), so I actually let them cook for about 20 minutes before adding chicken stock, wine, salt, and lots of pepper. I poured a second glass of wine here. The recipe does not tell you how long to cook the soup once you add the liquid. The last step is literally “Hope for the best.” I cooked it for about 20 more minutes until potatoes were cooked through and the starches in the potatoes naturally thickened the soup. I garnished with some homegrown chives and more pepper (and maybe another splash or two of wine). I liked the soup just fine, but it needed more than just potatoes and onions. Things I Learned: Next time I’ll add a lot more veggies: corn, peas, carrots, and even chicken or bacon. This soup was very creamy, even without any actual milk, cream, or cheese, which my mom uses heavily in her recipe. And this is why, for me, my mom’s recipe will always be better than Alice Hoffman’s grandmother’s. 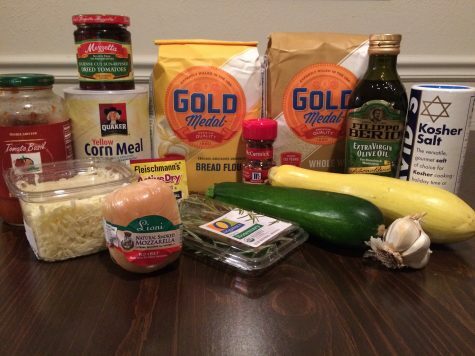 I decided to make the Kentucky Pizza because I am always on the lookout for a new pizza crust recipe and I was curious what zucchini and squash would add, texture-wise, to a pizza. 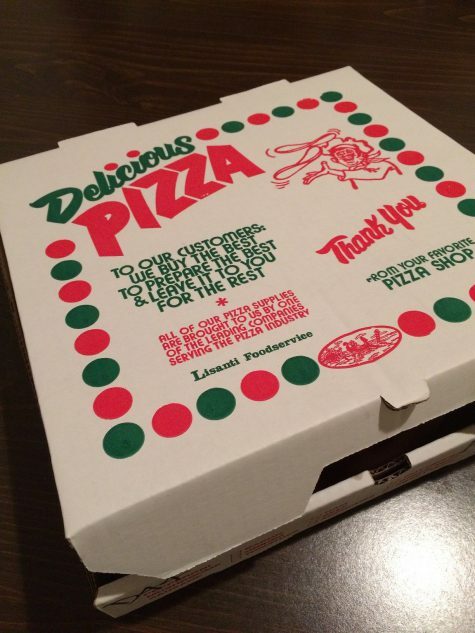 When I have made pizza dough before, the recipes usually call for you to let the dough rest for two hours, giving the yeast time to do its job. This recipe calls for a 24 hour resting period. So I made the dough on a Saturday in preparation for a Sunday pizza dinner. This recipe also mentioned using a pizza stone – and while I normally make my pizzas on a sheet pan I thought I would treat myself to a pizza stone and a pizza sheet (used to transfer your pizza to and from the hot stone). 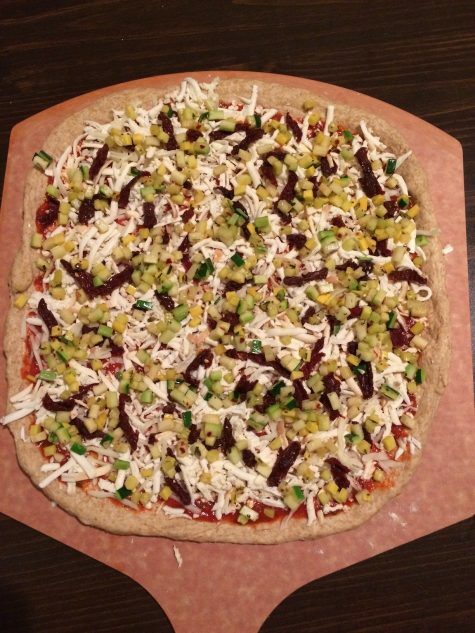 After preparing all my ingredients – shredding the smoked mozzarella and cooking the vegetables – I assembled my pizza on the pizza sheet. Things I learned: When you are trying out a new kitchen tool, like a pizza stone, you maybe should do a few test runs before trying a recipe that will be featured on a blog. 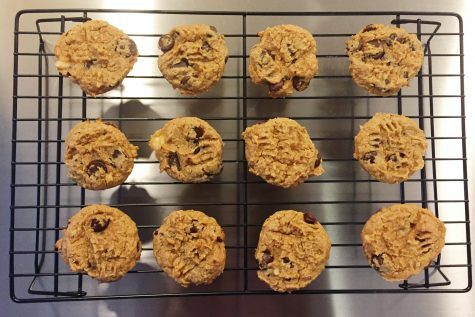 I’ve always found it kind of magical when a recipe makes strange ingredients tasty, so the editor’s own contribution to the cookbook, Disgustingly Good Cookies, caught my eye. 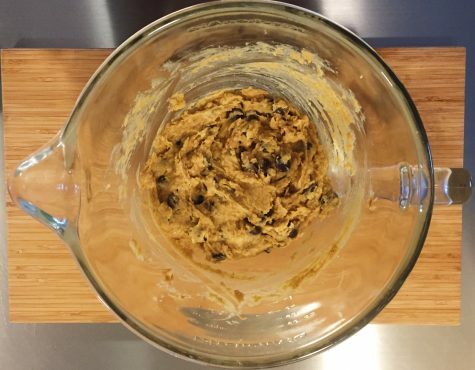 The recipe begins with chickpeas, drained, dried, and chopped in a food processor until they form a fluffy and surprisingly dough-like consistency. 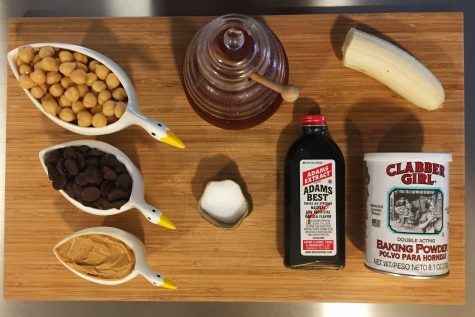 I added peanut butter, honey, vanilla, banana, and baking powder to the mix and finished it off with dark chocolate chips. I’m ashamed to say I was not brave enough to try the raw dough. 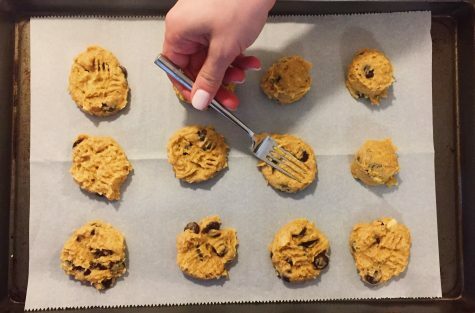 After scooping gobs of dough onto a cookie sheet and pressing them with a fork, I topped each cookie with a pinch of sea salt and put them into a 350 degree oven for about 13 minutes. The flavor is nutty, oaty, just sweet enough, and thankfully not reminiscent of chickpeas. The texture is more akin to no-bake energy bites than crispy, ooey gooey cookies. These are not the indulgent cookies that I would eat while binge-watching Netflix. They are the ones I would put in my gym bag for a boost of energy before spin class, if I went to spin class. Things I Learned: I still want to eat real cookies. But I’m glad to add this trick to my repertoire. I was drawn to Francesca Lia Block’s Apple “Betty” recipe at first because I would be able to eat baked apples and call it work. And second, because of the beautiful, but sad poem that went along with it. The early stanzas call for white tapers, a crystal, and a plastic horse. I hope everyone will be okay with my substitutions of white tea candles and a tuxedo cat. 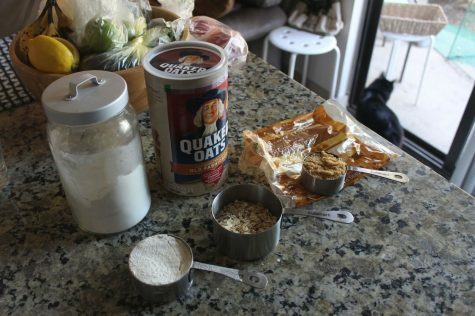 This recipe is about as simple as it gets, all I needed was flour, rolled oats, brown sugar, butter, and 4 apples. I’m always happy with a recipe that calls for things that I already have in my pantry. 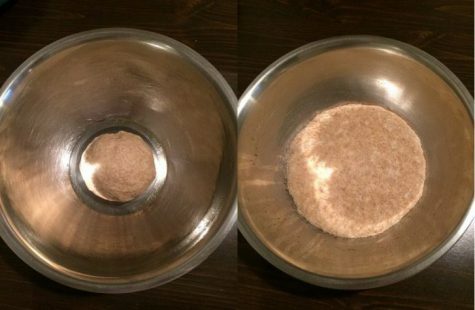 You combine all the dry ingredients together in a bowl, easy enough. And then I went to work peeling the 4 gala apples. 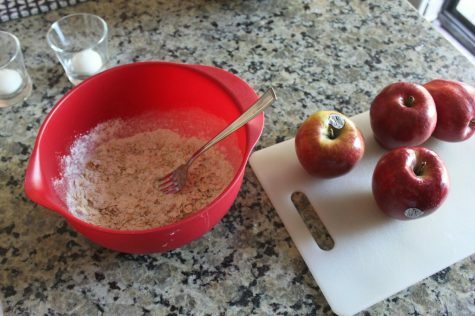 The recipe called for sweet or tart apples. I honestly do not know what the best apple is for baking, but gala apples are usually pretty sweet, so I chose them! 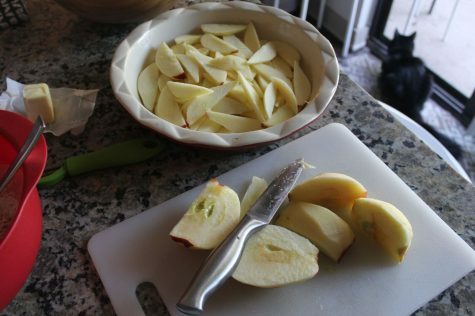 After peeling the apples I cut them into quarters and pared them. To be honest, I think I may have cut them a little thinner than I should, but they were all uniform and isn’t that what really matters in the end? I’m going to tell myself, yes. After all that cutting you throw the apples in the buttered pie pan. You melt the “cube of butter”, that is all it said in the recipe, so I used my best judgment. You melt it and mix that into the dry ingredients and then scoop it evenly onto the apples. I covered the pie pan with foil and baked it for 15 minutes then removed the foil and baked it for half an hour. It smelled amazing while it baked, 10 out of 10 for smell alone. 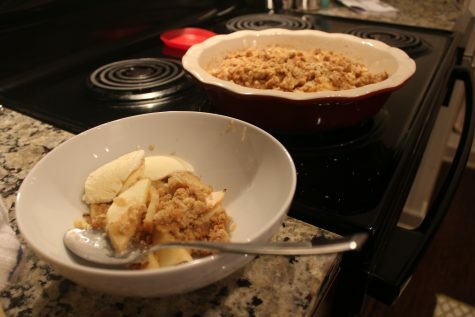 The first reaction I had was that the topping was good, but that was probably due to the clumps of warm, brown sugar. I wanted there to be cinnamon or nutmeg, some other flavor to really bring out the apple’s sweetness. But, for a recipe that I could make pretty much any day, at a moment’s notice, AND have Blue Bell ice cream, I was a happy camper. Things I learned: Warm, baked apples should still count as a serving of fruit, even when there’s ice cream involved. Also, it’s great when a recipe is simple, but expect the taste to be on the simple side. Please join us on Friday, April 21 at 7:00 p.m. to hear Natalie Eve Garrett discuss The Artists’ and Writers’ Cookbook: A Collection of Stories with Recipes. 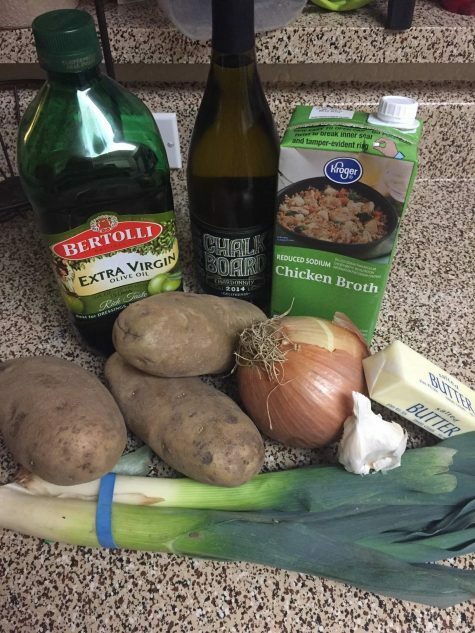 I will try the potato/leek soup. It is similar to one I use in the winter, Soupe Bonne Femme, from Gourmet Magazine’s Basic French Cookbook by Louis Diat. 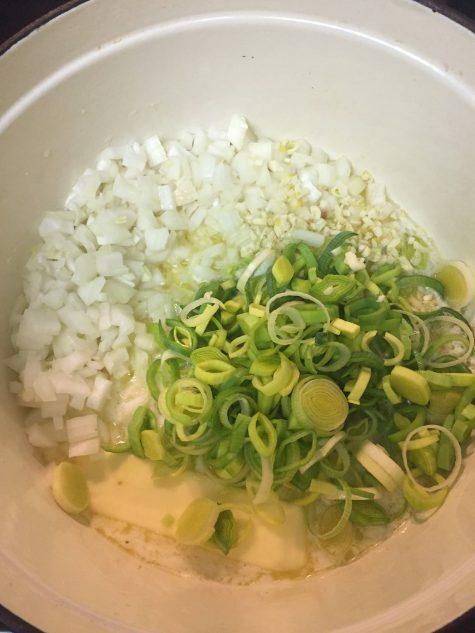 4 leeks cut in 1/3″ dice, 1 medium onion diced, 1 T butter, 4 – 5 potatoes peeled and diced in 1/2″ dice. Melt the butter, add leeks and onion a cook slowly for a few minutes until softened but not brown. Add the potatoes and 4 cups hot water. Simmer 30-40 minutes. Add 2 cups hot milk and 1 T butter. 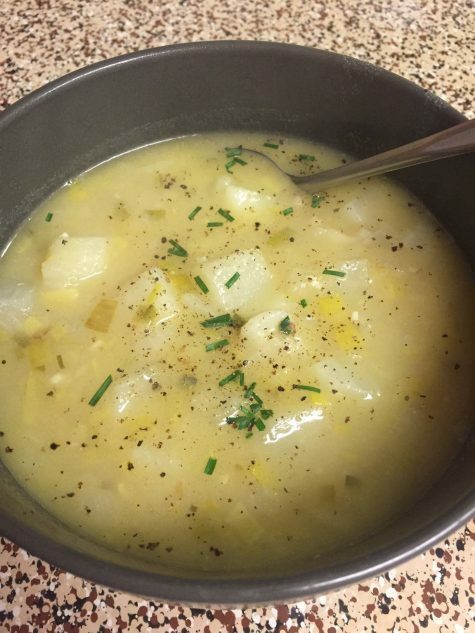 It’s delicious – just the right combination of leeks and potatoes! Bonne Appetit! 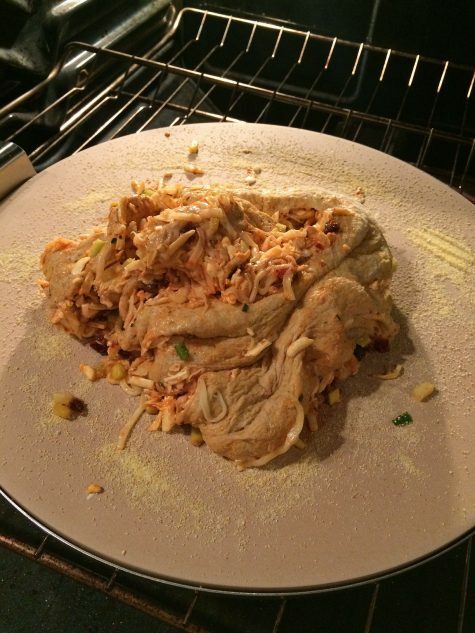 All of these recipies and the results are informative and funny. Thank you for making me smile first thing in the morning.